Behind the Beat: Drunk at Heart? Behind the Beat: Drunk at Heart? Behind the Beat: Drunk at Heart? Home » Music » Behind the Beat: Drunk at Heart? 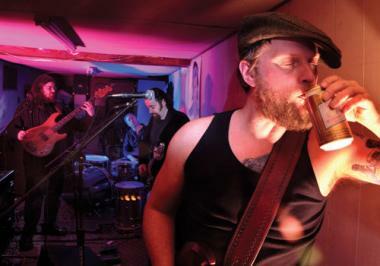 Alex Johnson, sometimes known as "Freddy Freedom," and fellow Drunk Stuntman Steve Sanderson have been staples of Pioneer Valley music since moving to the area in the early '90s from eastern Mass. The Stunt-front boys have also recently become attached to the octogenarian outfit known as the Young@Heart Chorus, and have been rewarded with a couple of tours of Europe and the recent opportunity to perform on The Tonight Show with Jay Leno and The Ellen Show, in support of YAH's recently released Fox Searchlight documentary. The lads took some time out from their rigorous, stunt-filled schedule to answer some questions for The Advocate. Valley Advocate: How long have you been playing music? F. Alex Johnson (Freddy Freedom): The band has been playing music together since 1992. One by one, we all eventually migrated to the western part of the state after a no-frills southeastern Massachusetts upbringing. Well, all of us except for our drummer, Dave. He hails from Rockaway, Long Island, and his upbringing is legendary, as in, we can only speculate. Your new album, State Fair, was produced by Mitch Easter (REM, Let's Active). How did you manage to get hooked up with him? Steve Sanderson: Our friend Morgan Kraft from Microearth Records started assisting Mitch in his studio, The Fidelitorium in Winston-Salem, N.C., last year. He thought we would be an interesting match, so he introduced us. Can you describe how you began collaborating with Young@Heart and maybe tell us about a few of the adventures you've had since becoming a part of their posse? SS: We met through Bob Cilman. Bob asked us to be a part of the annual Transperformance benefit for the Northampton Arts Council. The second or third year, we collaborated with the Chorus on a tribute to The Clash. The Chorus sang "Lost in the Supermarket" while pushing shopping carts around the stage. FF: We knew we were doing something special when, after a gig in Antwerp, Belgium, all 100 or so staff members sang us a goodbye song while waving handkerchiefs in the air, crying, and trying to summon us back to the club with bottles of wine and cheese. What was it like to perform on big Hollywood TV shows? FF: Ellen and Leno are two distinctly different parts of one very powerful, well-oiled NBC machine. Both were very professionally run, and they both took good care of us and made us feel welcome and at ease. Both are experiences I won't soon forget. But the difference in Ellen and Leno appears in the detrimental effects of staid legacy versus keen flexibility. Ellen, or I should say Ellen's producers, were much more receptive to our ideas for blocking and overall appearance. They let us do what we wanted to a certain extent. Leno's producers wanted to put on a circus show, and there wasn't much room for discussion. They wanted "more dancing" and "the older folks down in the front" so as to play up the obviously restricted mobility of some of the chorus members. I must emphasize that this all came from the show's two producers who sat in a booth high above the proceedings – all the people below them, the techs, PAs, production designers, musicians and security, as well as Jay himself, were super helpful and more than happy we were there. To answer your question: it was awesome. The Drunk Stuntmen host a CD release party in support of their latest effort, State Fair, at the Iron Horse, 20 Center St., Northampton, on April 25, 10 p.m. For details of the show, check out http://www.iheg.com, and for more information on ongoing stunts, visit http://www.drunkstuntmen.com or http://www.youngatheartchorus.com.